Uttarakhand formerly known as Uttaranchal is located in the northern region of India. It was founded on 9th November 2000. It is bordered by Uttar Pradesh, Himachal Pradesh, Haryana, Tibet & Nepal. Dehradun is also famous as the school capital of India. Dehradun is the one of the top cities of Uttarakhand in terms of higher education. This state is home to several top engineering colleges like Indian Institute of Technology (IIT), National Institute of Technology (NIT), etc. The literacy rate of Uttarakhand is 78.82 %. 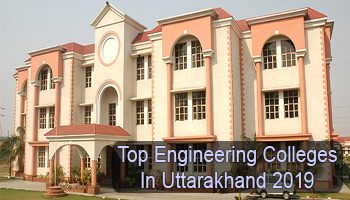 Here we are providing a list of Top Engineering Colleges in Uttarakhand 2019. At Sarvgyan.com, we have given a list of top engineering colleges in Uttarakhand for the year 2019. Here we have included IIT, NIT & various other public & private colleges of this state which offers a wide range of engineering courses. This list has been created on the basis of several factors which are national importance, quality of education, affiliation & approval of colleges, placement statistics, college infrastructure & facilities, student’s preferences, etc. In this state, students can apply for admission in B.Tech courses through JEE Main (national level examination). Some colleges also offer admission on the basis of merit list. UPES (University of Petroleum and Energy Studies) organizes its own entrance test (UPESEAT) for providing admissions. Admission in the lateral entry in B.Tech courses is provided through UKSEE entrance exam. Students can appear in the GATE exam for admission in M.Tech courses. Students looking for admission in engineering courses have options for lots of specializations to choose from. Some trending specializations among the students of Uttarakhand are Computer Science & Engineering, Electronics & Communication Engineering, Civil Engineering, Aeronautical Engineering, Electrical Engineering, Mechanical Engineering, etc. If you have any other queries about Top Engineering Colleges in Uttarakhand 2019, you may leave your queries below.